If the scrapbook album is your foundation, then cardstock will serve as your walls. What is it, you ask? Well, it's a thicker version of construction paper. As its name suggests, it's what is usually used to make cards. It comes in a myriad of colors and even multiple textures. Now, before you get lost in the possibilities, you must make sure that the cardstock is acid- and lignin-free. Why? If you use paper that contains acid and lignin, it will cause your pictures and memorabilia to disintegrate faster than they would naturally. Fortunately, you will be hard pressed to find cardstock that isn't acid- and lignin-free these days. It's also helpful to know a little bit about color when trying to pick the right cardstock for your scrapbook layouts. If you paid attention in art class back in school, a lot of this will sound familiar. Primary: Red, blue and yellow. These colors cannot be made by mixing other colors together, but they serve as the basis for all other pure colors (hues) in the color wheel. Secondary: These colors are made by mixing primary colors: red + yellow = orange, red + blue = purple and yellow + blue = green. Tertiary: Last, but not least, these colors are created by mixing one primary and secondary color. Specifically, there are six tertiary colors: red-orange, red-violet, yellow-orange, yellow-green, blue-green and blue-violet. These twelve colors can be classified further into warm and cool colors based on the feelings they evoke. Specifically, reds, oranges and yellows are usually referred to as warm colors because they give you a sense of warmth and are used to convey strong feelings (excitement, anger, etc.). Blues, greens and purples, on the other hand, are usually referred to as cool colors because they have a calming effect and tend to remind you of cool things (winter day or a still pond). For those of you who like to frequent the cosmetic aisle, these terms should sound at least vaguely familiar. Have you ever noticed that some cosmetics companies label their product colors as warm or cool? If not, take a look at a tube of lipstick next time you have the chance. See how the "warm" colors tend to have more red and the "cool" colors tend to have more blue… You'll soon find out that colors play quite a big role in every day life, especially when it comes to marketing! You're probably also wondering, what about baby blue or burgundy…how are they created? 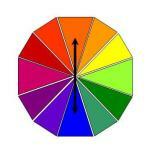 Colors such as these are created by adding white, black or gray to a pure color (e.g., red). For example, adding white to a pure color will create a tint (e.g., pink). When you add black to a pure color, it will create a shade (e.g., burgundy). If you're looking to tone down a color, you add gray to it. So, you're probably wondering, how is this going to help me pick cardstock? 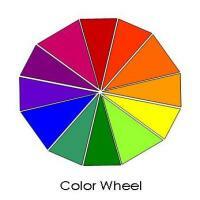 Well, it's actually very simple… Together, these twelve colors make up the basic color wheel. Scrapbookers, especially when they're first starting out, often find a color wheel helpful when determining color combinations for their layouts because sometimes selecting the right colors is not as simple as it seems. Your goal, when picking cardstock, is to select at least three colors that compliment your pictures. You will use one color as the background for your scrapbook pages, and the second and third colors can be used to mat your photos and other scrapbook elements. While you are free to use any color combination that you'd like, the color wheel takes the work out of identifying colors that look great together. To help you visualize the "traditional" color schemes, we'll use the example of picking cardstock to create a layout for Halloween and our main color will be orange. Monochromatic: This is the simplest color scheme. All you do is select one pure color and then use tints, shades and tones to vary the appearance of the scheme. In our example, we would use orange as the main color and then use colors such as peach and sweet potato to enhance our layout. To give your layout some contrast, try incorporating some neutral-colored cardstock (e.g., black). Bazzill Basics makes monochromatic color schemes very easy with their monochromatic paper packs. Analogous: This color scheme uses colors that are next to each other on the color wheel. You can't miss with these combinations, since analogous colors are already so similar. The key with this scheme is to use one main color and then one or two others to highlight certain features in your layout (e.g., focal picture mat). If you're having trouble differentiating between the analogous and monochromatic color schemes, just always remember that with the analogous color scheme moves "horizontally" across the color wheel, while the monochromatic color scheme moves "vertically" within the color wedge. For our Halloween layout, we could use red-orange and yellow-orange as our additional colors. Complementary: The complementary color scheme is determined by selecting two colors that are opposite of each other on the color wheel, such as red-green, yellow-purple or in our example, orange-blue. Now admittedly, you won't find too many Halloween layouts with orange and blue, but if your little one is a blue crayon for Halloween, you're set! As with the analogous color scheme, you want to use your colors in unequal proportions, since there is already such a high contrast between the colors. It's a matter of personal preference as to which color is dominant, but if you really want your pictures to pop, use the cool color for your background and the warm color for accents. If you're looking for more variety, you can try a split-complementary scheme. This is created by taking a color and the two colors to either side of its complement. Confused?... In our example, the split complement color scheme for orange is blue-violet and blue-green. Click here to see an example of a scrapbook layout made using complementary-colored cardstock. : The triadic color scheme is composed of three colors. To determine the colors within a triadic color scheme, you first need to draw an equilateral triangle in the middle of the color wheel. Use your main color as the top of the triangle. The two bottom points of the triangle will identify the other two colors within the scheme. Now that you can visualize how the scheme is determined, you'll notice that the colors are equidistant (four colors) from each other. Having geometry flashbacks? Not to worry… Most color wheels you can purchase will do all the work for you. In our Halloween example, a triadic color scheme would include orange, green and purple. So, if you have always been wondering why you see purple as an accent color on Halloween items…now you know! This is just the proverbial tip of the iceberg when it comes to colors and color combinations. You can get into color schemes with four colors, but we’re trying to keep it as simple as possible. Now that you know all you wanted to and more about color…you're probably wondering where you can buy cardstock. Fortunately, this is an easy one to answer! You can buy archival quality cardstock just about any where – it all depends on the variety of color you're looking for. If you're looking for the basic colors, you can go to Target, Wal-Mart or any "big box" type of store and get paper packs. Looking for more variety? Your local craft store (Michael's, A.C. Moore, etc.) will offer you paper packs in a greater variety of colors, as well as by-the-sheet paper, if you only need a particular color. Lastly, you may live in an area that has an actual scrapbook store, which only sells scrapbook supplies. You will be hard pressed to find paper packs in these stores as they specialize in by-the-sheet paper offerings. You can usually find every color under the rainbow in these stores. Note: As with anything these days, you can find a plethora of cardstock from online retailers. Our favorite manufacturer of cardstock is Bazzill Basics. Not only do they provide paper in a rainbow of colors, but you can also get paper in different textures like criss-cross, orange peel and corduroy.